IF APPLICABLE, DIGITAL UV CODES ARE NOT INCLUDED. Disc(s) are professionally cleaned and may contain only light scratches that do not effect functionality. Includes disc(s), case, and artwork. May be missing booklet. TURNER, IKE. PROUD MARY THE BEST. RATES FOR 1 CD. The item in the picture is the item you will receive. IMPORTANT NOTE. All records are graded visually and very strict. Located in Shimokitazawa, Tokyo, Japan. DISC: A little scratch, crack or slit on CD, Play perfect. MADE IN AUSTRALIA. Back Cover: Very Good. Cover/Booklet: Very Good. I Like Ike: The Best of Ike Turner (Rhino) - Ike Turner; Jackie Brenston & His.. I Like Ike: The Best of Ike Turner (Rhino). Publisher: Rhino. Condition: Used: Very Good. DISC: Mint, no scratch, crack or slit on CD. Back Cover: Like New. MADE IN USA. Disc: Like New (Near Mint), Insert: Very Good (Very Good ), Case: Generic (New). Light tab marks on front edge of insert. Not a promotional, white label, or club CD. No cut-out or remainder marks anywhere on the case or insert. IKE TURNER SESSIONOGRAPHY 4 CD NEW! Eine exzellente Compilation, die die frühen Jahre von Ike Turner als Produzent und Sänger präsentieren. Turner nahm für viele der wichtigsten R&B Labels der 50s und 60s auf, darunter Chess, Modern, Trumpet, Flair und Sue. Back Cover: MINT. Cover/Booklet: MINT. Disc: MINT. No scratches and scuffs. MADE IN USA. Your item will be previously owned but still in great condition. The disc will play perfectly without interruption and the case, inlay notes and sleeve may show limited signs of wear. We all like the idea of saving a bit of cash, so when we found out how many good quality used products are out there - we just had to let you know! She Made My Blood Run Cold - The Kings of Rhythm. Jack Rabbit - Icky Renrut. Hoo Doo Say - The Sly Fox. Wicked Little Baby - Clayton Love. Do Right Baby - Billy Gayles. Sad As a Man Can Be - Billy Gayles. CD in mint/near mint condition in jewelcase. Living For The City 3:41. Early In The Morning 3:39. I Heard It Through The Grapevine (Live) 3:27. A Love Like Yours 3:56. I Want To Take You Higher 2:54. Title : Live Raw & Funky. Condition : Good. Product Category : Music. List Price (MSRP) : 13.98. 7 Jack rabbit 00:02:24. 4 She made my blood run cold 00:02:19. 28 Peg leg woman 00:02:24. Hier folgende CD / Here following CD 6 Wicked little baby 00:02:32. Ike & Pinetop's Boogie. Steel Guitar Rag. Baby's Got It. Five Long Years. I Want To Take You Higher. Proud Mary. I've Been Loving You Too Long. I'm The Only One. WALKING DOWN THE AISLE (Take 4) - Ike Turner & The Ikettes. YOU CAN'T HAVE YOU CAKE AND EAT IT TOO - Vernon Guy with Ike & Dee Dee. TIN PAN ALLEY (Take 1) - Jimmy Thomas. Hier folgende CD / Here following CD. Hier folgende CD / Here following CD "Rock" (Rock / Rockpop). Love is scarce. I'm tired of being dogged around. A woman just won't do. My heart in your hands. Night howler. I ain't drunk. 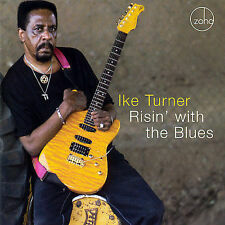 IKE TURNER - RHYTHM ROCKIN' BLUES CD NEW! 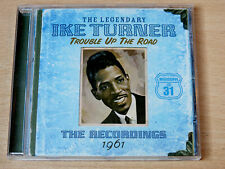 IKE TURNER-STUDIO PRODUCTIONS 1963-1965 CD NEW! Hier folgende CD / Here following CD The New Breed (Part 1). The New Breed (Part 2). "Rock" (Rock / Rockpop). Go To It aka Stringin' Along. Cuban Getaway (Aka Bayou Rock). Loosely aka The Wild One. Twistin' The Strings. IKE TURNER - IKE'S INTRUMENTALS CD NEW! 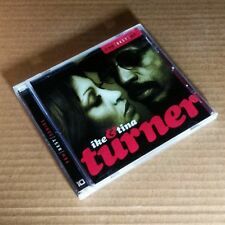 Up for Grabs, Ike & Tine Turner A Reflection Of CD - New. CD New – Not Sealed. you're still my baby. too much man for one woman. sugar, sugar. never been to spain. Mississippi rolling stone. lets get it on. Rockin' Blues 00:02:53. These dreams 00:02:54. Hier folgende CD / Here following CD You're still my baby 00:03:02. Later for you baby 00:02:41. (You can have) The city 00:03:42. Rats 00:04:01. Flockin' with you 00:02:51. Party Vibes. Only Woman Bleed. Turner,Ike - North Sea Jazz Festival 2002 CD + DVD NEW! Buddy Guy - Cobra. Title:Buddy Guy - Cobra. Artist:Buddy Guy. Your item will be previously owned but still in great condition. The disc will play perfectly without interruption and the case, inlay notes and sleeve may show limited signs of wear. IKE TURNER "REAL GONE ROCKET - SESSION MAN EXTRAORDINAIRE" CD NEW! My Real Gone Rocket - Jackie Brenston. I Ain't Drunk - Lonnie The Cat. Peg Leg Woman - Willie King. Hier folgende CD / Here following CD Erscheinungsdatum / Release date: 30.03.2012. Rock englischsprachig. 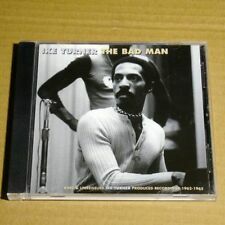 IKE TURNER - SHE MADE MY BLOOD RUN & THE KINGS OF RHYTHM CD NEW! 7 Jack rabbit 00:02:24. 4 She made my blood run cold 00:02:19. 28 Peg leg woman 00:02:24. Hier folgende CD / Here following CD 17 Dry up baby 00:01:59. IKE & TINA TURNER - DIAMONDS ARE FOREVER 2 CD NEW! Hier folgende 2 CD / Here following 2 CD Contemporary R&B. Black/Soul/Blues/R&B/Gospel. Very Good Condition Excellent To Mint Condition Or. New (not sealed) & New And Sealed . Artist:IKE TANDINA TURNER. Your item will be previously owned but still in great condition. The disc will play perfectly without interruption and the case, inlay notes and sleeve may show limited signs of wear. This item is a manufactured-on-demand release. Using recordable CDs & DVDs, the label who owns the rights to these MOD releases, custom burns discs for each order sold. Format: CD. We cannot be held responsible for delays if you do not use this reference. Rockin' And Rollin' Again. In superb condition with picture insert in a jewel case. Baby Get It On. I Got It Ready For You Baby. Twist And Shout. Sweet Rhode Island Red. I'm Movin' On. Stormy Weather.